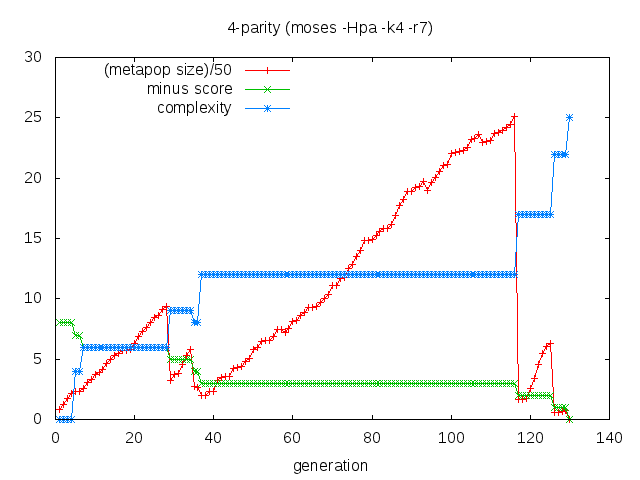 I’ve been studying MOSES recently, with an eye towards performance tuning it. Turns out optimization algorithms don’t always behave the way you think they do, and certainly not the way you want them to. Given a table of values, MOSES will automatically learn a program that reproduces those values. That is, MOSES performs table regression: given N columns of “input” values, and one column of “output”, MOSES will create a program that outputs the output, given the inputs. 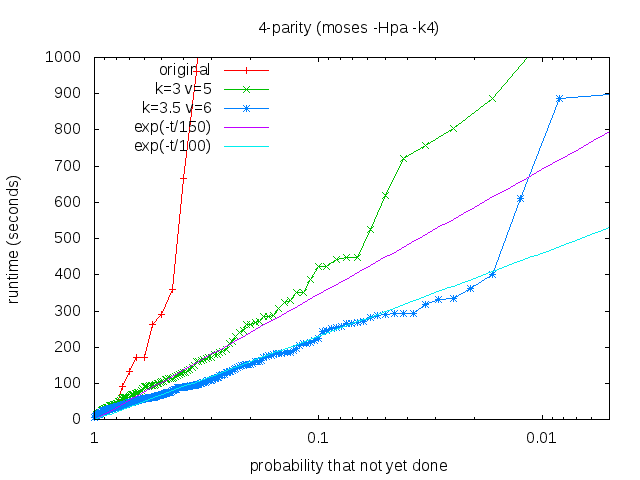 MOSES can deal with both floating point and boolean inputs, and thus can learn, for example, expressions such as ((x<2) AND b) OR (x*(y+1) >3). MOSES programs are real “programs”: it can even learn branches and loops, although I won’t explore that here. 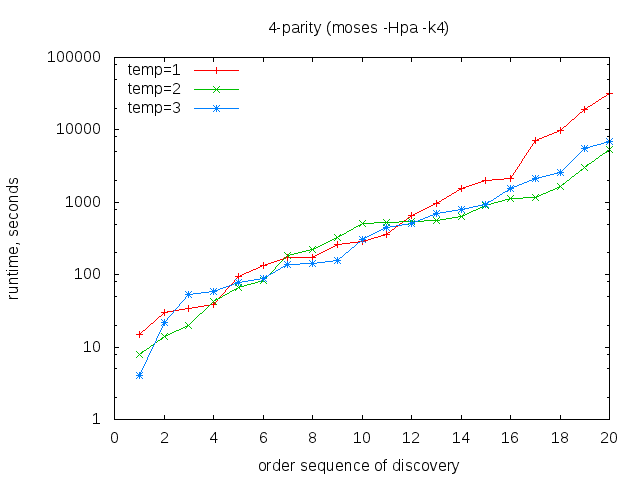 For performance tuning, I studied the 4-parity problem: given 4 input bits, compute the parity bit. Written out in terms of just AND, OR and NOT, this is a fairly complex expression, and is rather non-trivial to learn. 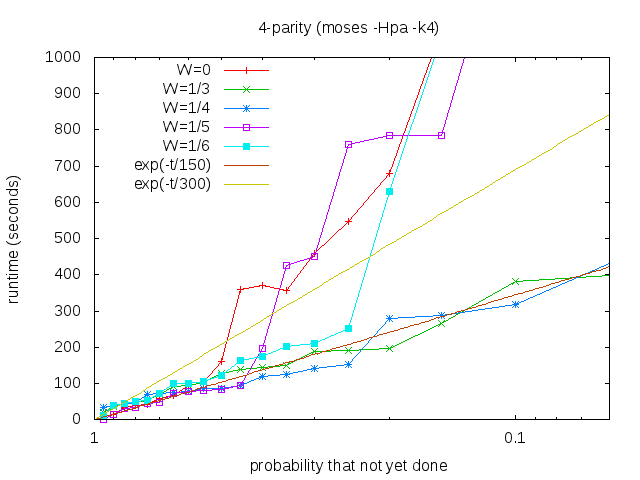 MOSES performs learning by keeping a “metapopulation” of example programs, or “exemplars”. These are graded on how well the match the output, given the inputs. For the 4-parity problem, there are 24=16 different possible inputs; a given program may get any number of these correct. For example, there are 16 ways to get one answer wrong; 16×15 ways to get two wrong, 16×15×14 ways to get three wrong, etc. This is the binomial distribution: (16 choose k) ways to get k answers wrong, in general. But this doesn’t mean that there are only 16 different programs that get one answer wrong: there are zillions: some simple, some very very complex. Metapopulation size as function of generation number. The red line shows the metapopulation size (divided by 50), as a function of the generation number (that is, the iteration count). It can be seen to collapse every time the score improves; here, the “minus score”, in green is the number of wrong answers: a perfect score has zero wrong answers; the program stops when a perfect score is reached. One the vertical axis, the amount of time, in seconds, to find a solution. One the horizontal axis, the order in which a solution was found, out of 20 random attempts. The way to read this graph is as follows: there is a probability Pr=1/20 chance of finding a solution in about 10 seconds. There is a Pr=2/20 chance of finding a solution in about 20 seconds, etc. Continuing: about a Pr=6/20 chance of finding a solution in less than about 100 seconds, and a Pr=17/20 chance of finding a solution in less than about 1000 seconds. The shape of this graph indicates that there is a serious problem with the current algorithm. To see this, consider running two instances of the algorithm for 300 seconds each. Per the above graph, there is a 50-50 chance that each one will finish, or a 75% chance that at least one of them will finish. That is, we have a 75% chance of having an answer after 600 CPU-seconds. This is better than running a single instance, which requires about 900 seconds before it has a 75% chance of finding an answer! This is bad. It appears that, in many cases, the algorithm is getting stuck in a region far away from the best solution. This graph shows the same data as before, but graphed differently: the probability of not yet having found a solution is shown on the horizontal axis. Note that this axis is logarithmic, so that the exponential decay bound becomes a straight line. Here, the straight purple line shows the bound for a 500 second decay constant; ideally, we’d like an algorithm that generates points below this line. where temp is the “temperature” of the distribution. 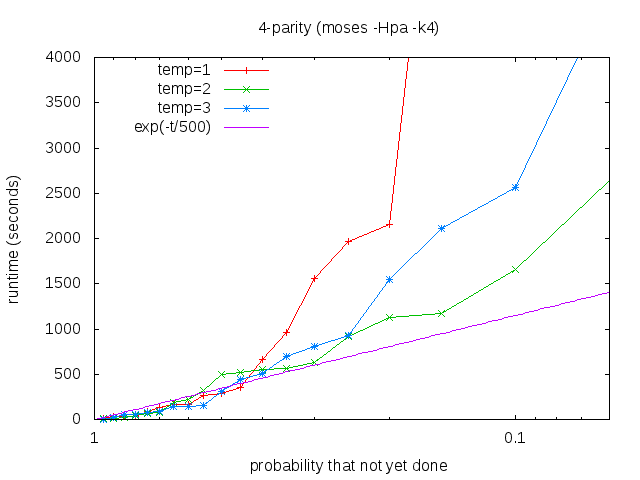 The original MOSES algorithm used temp=1, which appears to be a bit too cold; a temperature of 2 seems about right. With luck, this new, improved code will be checked into BZR by the time you read this. Runtime, using a limited population size. Clamping the population size clearly improves performance — by a factor of two or more, as compared to before. However, the troublesome behavior, with some solutions being hard to discover, remains. Now, to attack the main issue: Lets hypothesize what might be happening, that causes the exceptionally long runtimes. Perhaps the algorithm is getting stuck at a local maximum? Due to the knob-insertion/tweaking nature of the algorithm, there are no “true” local maxima, but some may just have very narrow exits. The standard solution is to apply a simulated-annealing-type trick, to bounce the solver out of the local maximum. But we are already using a Boltzmann factor, as described above, so what’s wrong? Two sets of data points, those for W=1/4 and 1/3, look very good. Its somewhat strange and confusing that other W values do so poorly. I’m somewhat worried that the W=1/4 value is “magical”: take a look again at the very first graph in this post. Notice that every time a better solution is found, the complexity jumps by about 4. Is this ﻿the W=1/4 value special to the 4-parity problem? Will other problems behave similarly, or not? I do hope that this post does offer some insight into how MOSES actually works. A general overview of MOSES can be found on the MOSES wiki, as well as a detailed description of the MOSES algorithm. But even so, the actual behavior, above, wasn’t obvious, at least to me, until I did the experiments. A short footnote about the generic and fundamental nature of the exponential decay of time-to-solution in search problems. Earlier in this post, there is a derivation of exponential decay as the result of running N instances in parallel. How should this be understood, intuitively? Search algorithms are, by nature, highly parallelizable: there are many paths (aka exemplars) to explore; some lead to a solution, some do not. (An exemplar is like a point on a path: from it, there are many other paths leading away). A serial search algorithm must implement a chooser: which exemplar to explore next? If this chooser is unlucky/unwise, it will waste effort exploring exemplars that don’t lead to a solution, before it finally gets around to the ones that do. By contrast, if one runs N instances in parallel (N large), then the chooser doesn’t matter, as the N-1 ‘bad’ exemplars don’t matter: the one good one that leads to a solution will end the show. Thus, we conclude: if a serial search algorithm follows the exponential decay curve, then it has an optimal chooser for the next exemplar to explore. If it is “worse” than exponential, then the chooser is poorly designed or incapable. If it is “better” than exponential, then that means that there is a fixed startup cost associated with each parallel instance: cycles that each instance must pay, to solve the problem, but do not directly advance towards a solution. Ideal algorithms avoid/minimize such startup costs. Thus, the perfect, optimal algorithm, when run in serial mode, will exhibit exponential solution-time decay. 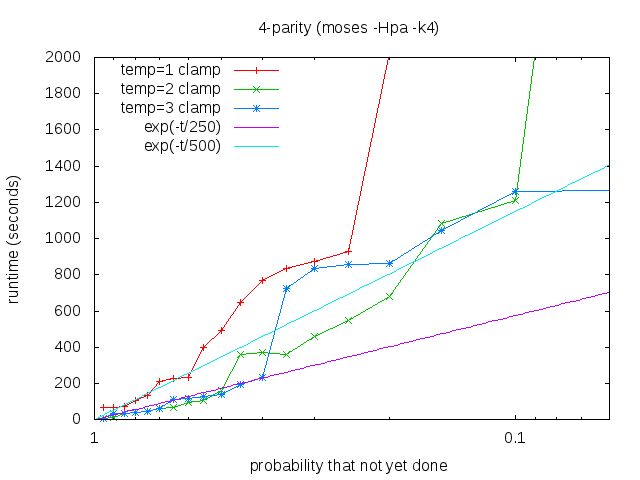 This entry was posted in Design, Development, Documentation, Theory and tagged Learning, MachineLearning, MOSES. Bookmark the permalink.